Nisbit’s plumbing — James Nisbit, who was for quite a number of years employed by Benno Nadeau in the plumbing business, started in that business himself and opened a plumbing shop on Main Street in the building adjoining the Grange store on the north. He carried a complete stock and outfit, and was prepared to do any kind of plumbing work. Legislature — Several drastic measures passed by the last Legislature in the advancement of prohibition went into effect. They included a provision for a mandatory imposition of a jail sentence; broadening injunction proceedings in relation to owners of buildings in which liquors were sold; removal of County Attorneys for failure to enforce the prohibitory laws; and forfeiture of vehicles used in the transportation of liquor. Ffirst lieutenant — 1st Lt. Percy W. Willett, of Presque Isle, was promoted from the rank of 2nd lieutenant at Daniel Field, Augusta, Ga., where he was on duty with the Air Corps as assistant base ordinance officer. Air Raid siren tests — The air raid sirens of Presque Isle, a long blast, were planned to be tested every Saturday at noon. Sergeant Charles A. Hall — Sgt. Hall, 34 years old, married with three children, was the fingerprint man and the firearms instructor for the department, attended police training courses in basic police training, firearms instructor training and took a course in fingerprints, civil and criminal investigations, police photography, handwriting and typewriting identification, and firearms investigation and the Modus Operandi Systems. 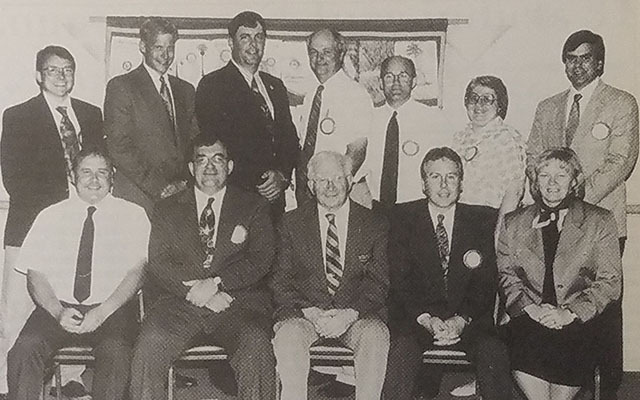 Image award — Ora C. Sith, Exalted Ruler of the Presque Isle Lodge of Elks, announced that the lodge won the Public Image Award for the State of Maine. This award is based on the lodge with best all around community service, patriotic service, veterans service, youth activities, youth leadership awards and scholarship awards program. The award was presented at the National Convention in New York City. County Cycle Classic — Brewer’s Scott Seymour captured his second consecutive County Cycle Classic title by covering the grueling 22-mile course from Van Buren to Caribou in a time of 59 minutes 29 seconds. Lyn Michaud of the Ski Shop in Van Buren, co-sponsor of the annual event, presented Seymour with a $1,200 graphite frame donated by Racing Bike of Van Buren. In the women’s division, Janna Stabile of Brewer captured first place with a time of 1:08.58. Stabile received a Headway Helmet donated by the Ski Shop. Varsity hockey — The dream of a group of local hockey supporters to bring varsity hockey to SAD 1 became a reality June 29 with the presentation of the final check in a three-year financial commitment. For the Presque Isle Hockey Supporters, a group consisting of parents, former players and other interested people, the final installment of $11,000 toward the program represents the culmination of three years of fundraising activities and a lot of hard work.